Tired of wrestling with your food on the BBQ? Want to make cooking more enjoyable and less time consuming? Then try the Pig Tail Food Flipper. 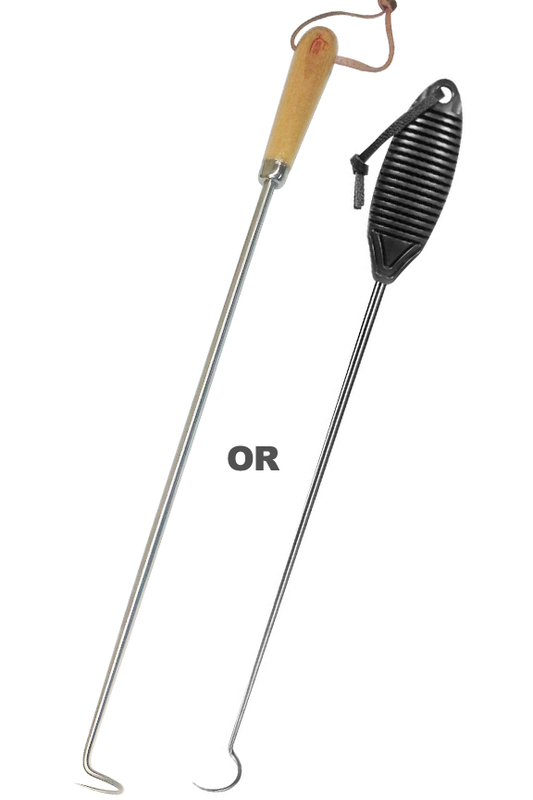 This funny looking tool has a pretty silly name, but when it comes to grilling, it is all business. What once was messy and frustrating will become quick and simple. This amazing utensil will eliminate common annoyances like slipping and sliding, and will allow you to flip and turn food with ease. With a spatula, you can only pick up certain types of food, and with tongs you end up squishing or dropping the meat half the time. Adding things like sauces and marinades only complicates the issue, and forget about delicate foods like fish. The Pig Tail Food Flipper solves all of those problems and leaves you with one superior tool that can do every job with darn near every food. High quality components ensure this tool will last for years, but the manufacturer also provides a lifetime replacement warranty too. This means that you buy it once, and keep it for years of frustration free cooking and grilling. The long pointy part of this tool is made from surgical grade stainless steel, and it has a durable wood handle that is ergonomically designed. It is comfortable to hold for long periods, and also stays cool to the touch around intense heat. The curly end portion is where the magic happens, and it is quite sharp, as well as, perfectly angled. With a quick flip of the wrist you can pick up any kind of food to turn it, flip it, pick it up or even carry it. The point won't leave a large hole, and does way less harm to food than traditional tools. Instead of fumbling with tongs to get the right angle, or pushing things around the grill with a spatula, use this tool to make the job much quicker and more simple. It can even flip very delicate foods without harm because you barely need to touch it to get a good grip. This is the large size Pig Tail. We also sell the Small Pig Tail and a 2 Piece, Pig Tail Set that includes one of each. Due to the long reach that this 19" tool provides, it is ideal for grilling, but can also be quite useful in the kitchen too. Outside, it will help you move quickly when flipping many cuts of meat to ensure that cooking remains even and you keep as much heat in the grill as possible. 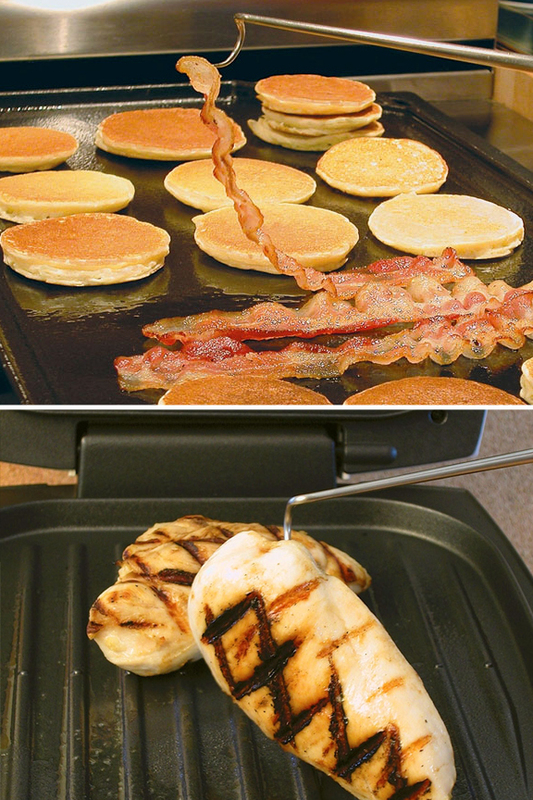 If cooking burgers, hot dogs and chicken all at once, the Pig Tail can flip them all instead of the usual routine of spatula for burgers, tongs for hot dogs, and who knows what for chicken. Simply swoop in quick with this versatile utensil and flip them all, rearrange the whole grill and then take them off the fire when done. There is no need for other tools when you have one this good. Take it inside and you can use it at the stove or even in the oven. Use it at breakfast time for bacon and french toast, at lunch for grilled cheese, and at dinner to remove corn on the cob from a pot of hot water or flip meat in a pan. 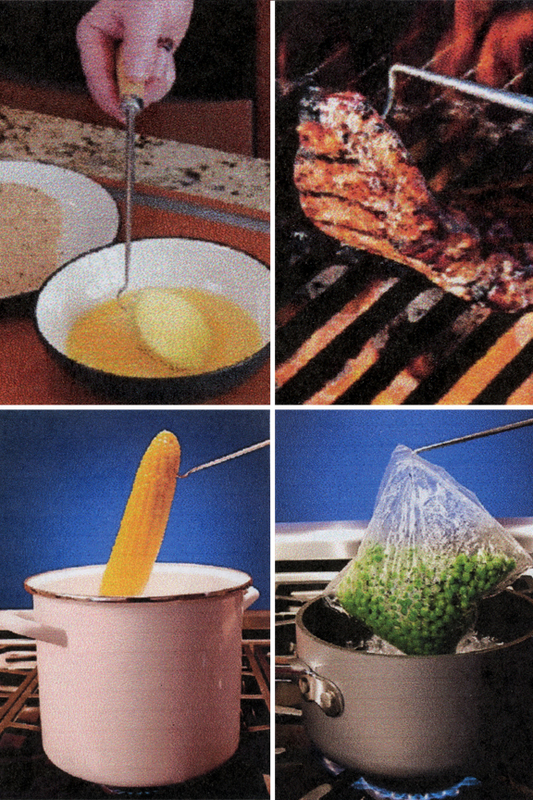 It can even be used to pull or arrange food in the oven thanks to the reliable grip and long reach. No cooking enthusiast should be without this tool. It saves time, and simplifies the process while making the user look more professional. It can help to increase speed and quality all at the same time and it is more fun to use. The original version is designed for right-handed people due to the direction of the point. We also carry the left-handed version, so make sure to choose the correct one when ordering. Large Pig Tail Food Flipper - 19" - The perfect grilling utensil to make flipping and turning faster and easier. This tool makes grilling more fun and less frustrating. Was very surprised how well this flipper works and how much it helps flipping heavy items like a 4 lb brisket. Recently I purchased a CHAR BROIL gas grill for my backyard cooking. 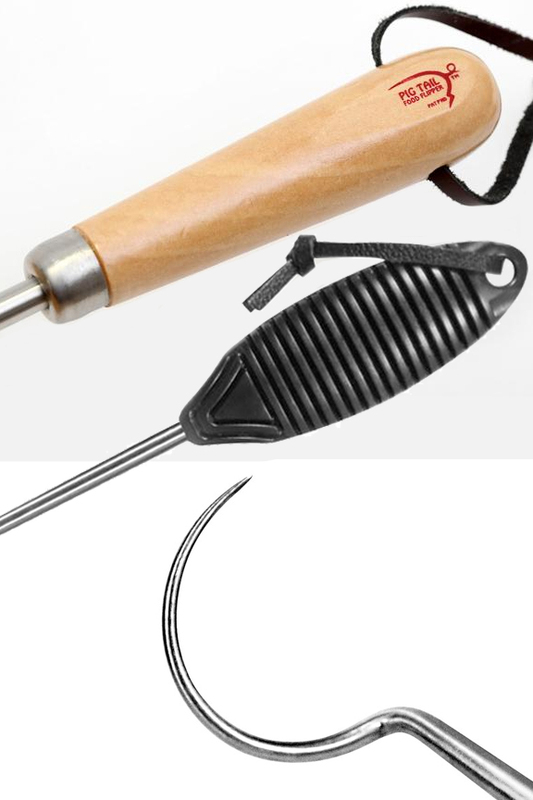 I accidently came across an advertisement of a cooking tool called a Pig tail food flipper. After watching the commercial, I had to have one. I ordered the 19" Lg. Food Flipper. At first, it took a few turns with the flipper to flip our Steaks and Hamburgers, but after grilling a few steaks and hamburgers I had a great experience using the flipper. Nicest part, it has such a fine steel point on the end, that when you hook the meat, its simple to turn and remove meat from the Grill, not a ton of hole normally made with a huge fork to turn meats. I love it, and will recommend it to everyone I know who love to Grill outdoors. R.
As described if you enjoy grilling and are generally a Foodie this a must have! It is a very well-made culinary tool!!! If you are right handed, you will want the regular, right handed version. The point will curve inward to allow for a natural motion when moving food. If you used one intended for left-handed folks, the point would be oriented in the opposite direction, so you would have to back hand everything instead of poking it easily.